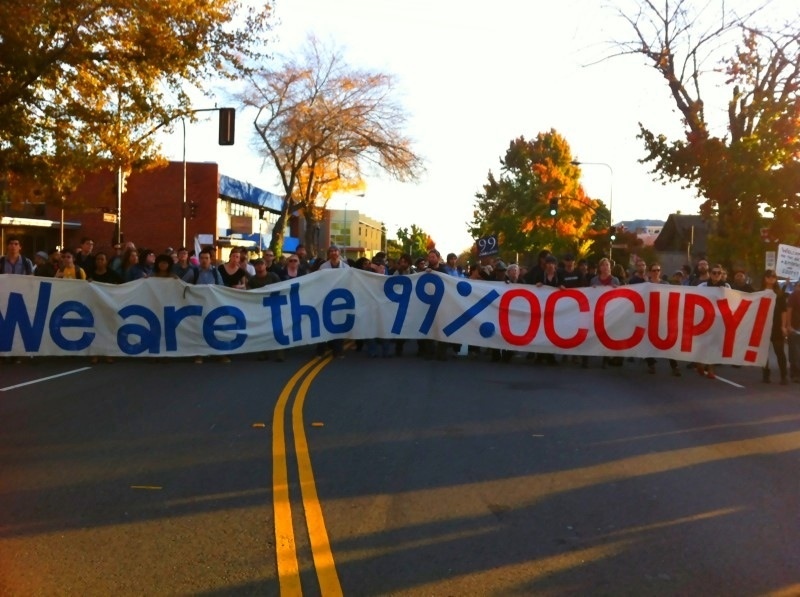 BERKELEY, California – Last week, demonstrators including students and faculty attempted to #Occupy a lawn on campus with tents in conjunction with the #OccupyWallStreet movement. Police responded by beating demonstrators with linked arms using batons. In response to police brutality, demonstrators held a general assembly and called for a strike for today. Since then, to add insult to injury, the UCB chancellor declared that demonstrators had been acting violently by merely linking arms. 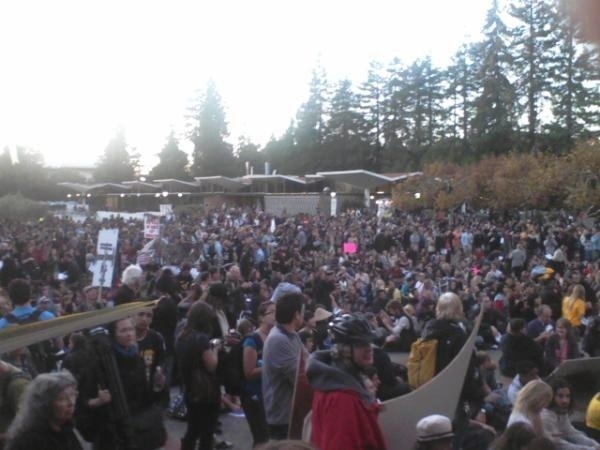 As of noon, thousands of demonstrators have amassed in sproul plaza. 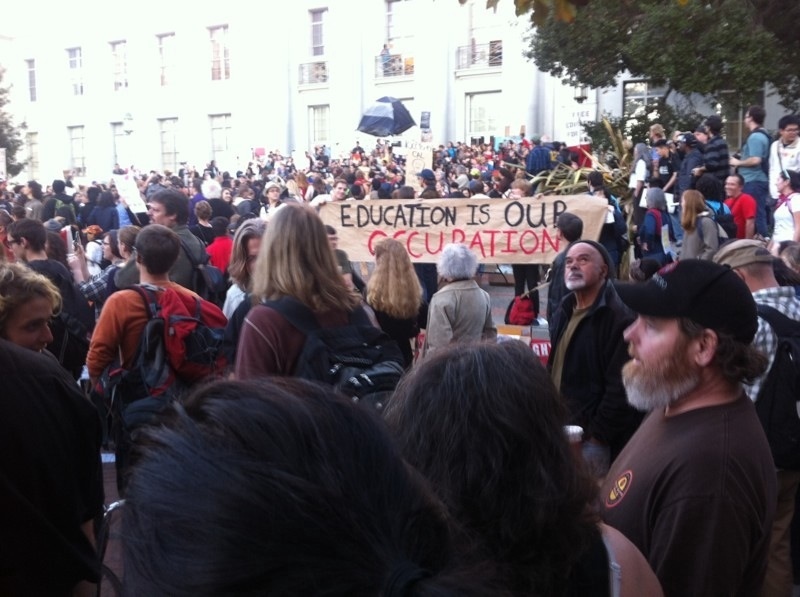 A variety of teach outs and other events have been scheduled for the day. See the schedule here. 2:15pm: UCPD shoots an individual at Haas school of business for allegedly carrying a weapon. 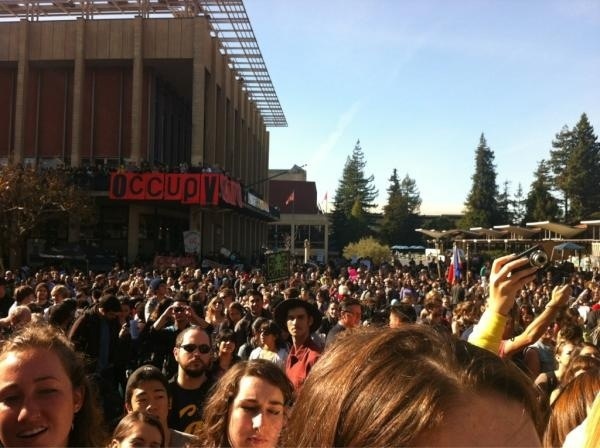 UC officials have not stated if the incident was related to #OccupyCal. ~2:30pm: Around 400 demonstrators at UC Davis march to Mrak Hall, the main administrative building on campus, and occupied the lobby of the building in solidarity with Cal. ~4:30pm: The solidarity march from the oakland commune to UC Berkeley is on telegraph spanning several blocks. 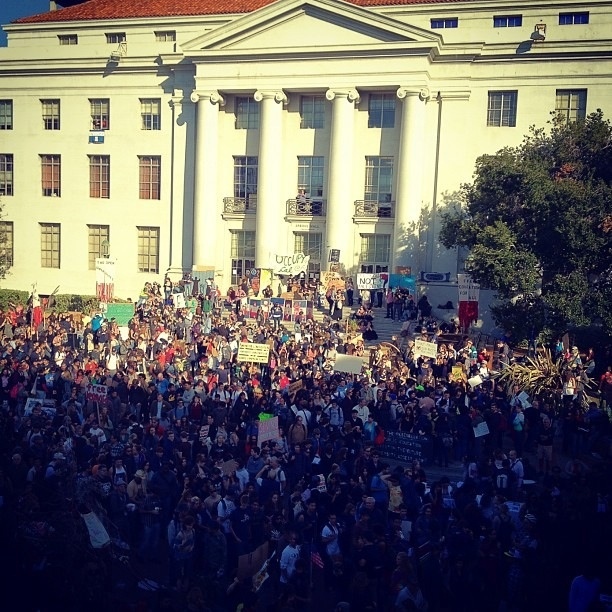 4:45pm: Oakland marchers join Berkeley demonstrators in Sproul plaza. GA to begin at 5pm. 6:50pm: Demonstrators are still inside Mrak Hall at UC Davis. Some UCDPD are outside, but no signs of Davis police. 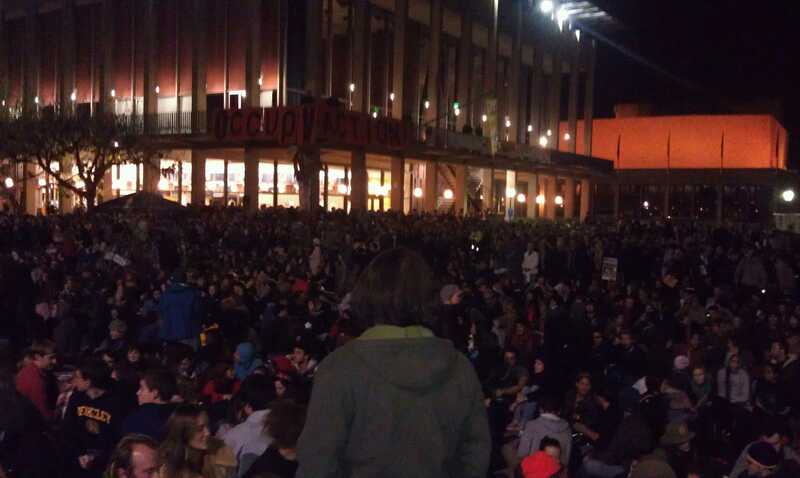 UC Berkeley demonstrators are still holding at General Assembly. 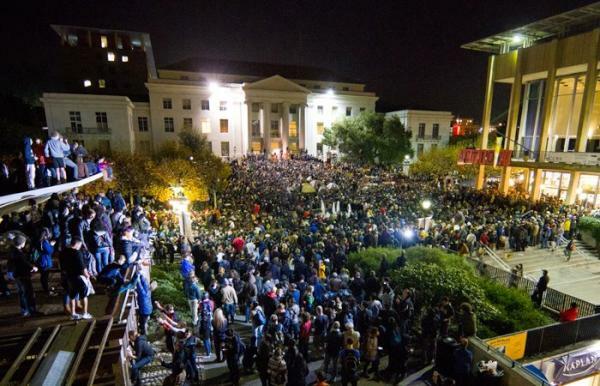 8:15pm: Estimations of crowd size at Berkeley is difficult, but probably between 3-7000. It’s so crowded people are climbing on top of nearby buildings. 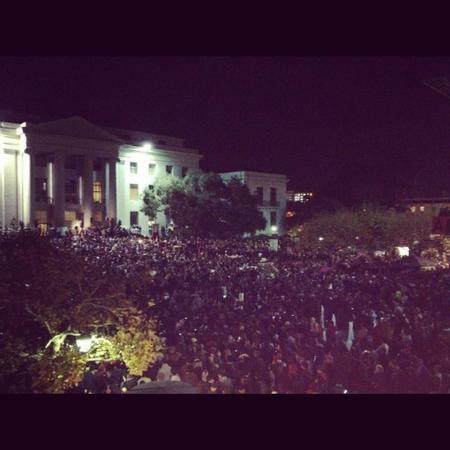 9:35pm: Doors u-locked open as droves of cops arrive at UC Davis. Many people in the building. An on-campus co-op (that brought us dinner) is having its weekly house meeting here. 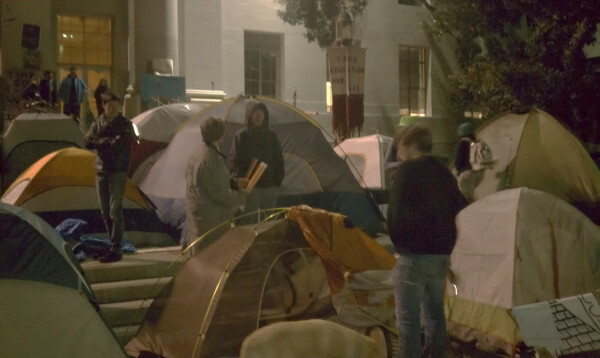 3:00am: Berkeley students are regrouping their tents while some police surround the encampment. Its unclear if they’ll be raided tonight. Word from San Francisco is that one of their satellite encampments, at Market st. next to Bank of America, is being forced to leave, but the police are saying the other encampments (eg. Justin Herman Plaza) will not be raided. Read more: dailycal, oaklandtribune. 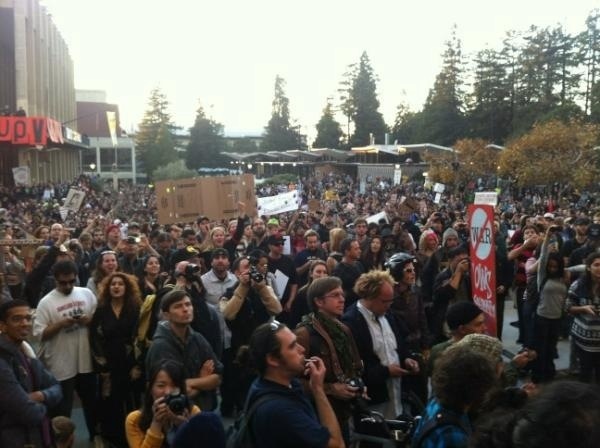 UC Davis Mrak Hall is still occupied! UCD livestream: 1, 2. 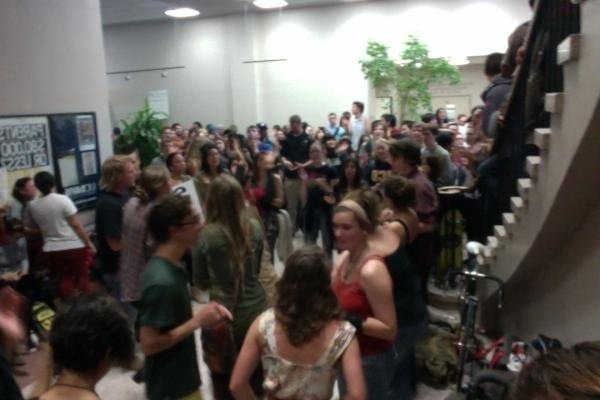 4:00am: A good 90+ people in Mrak Hall. ~2:30pm: Mrak Hall was raided by police. No one appears to have been arrested. 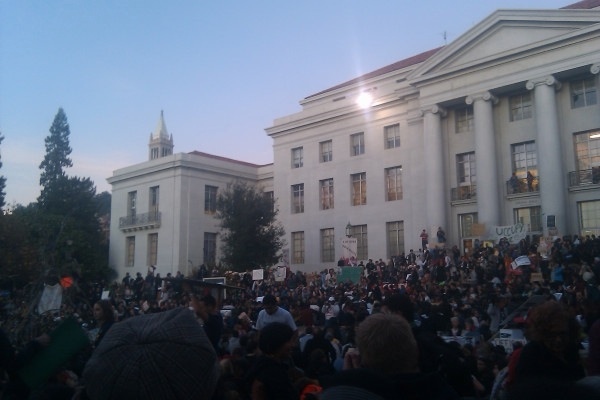 Organizers are calling for a General Assembly at 4:30pm in front of Mrak Hall. 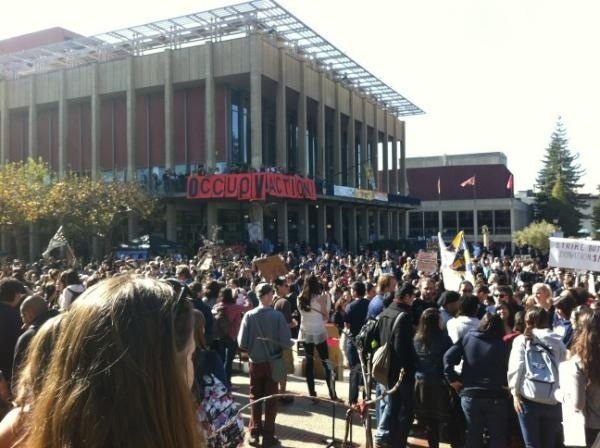 Demonstrators at CSU Northridge formed an #OccupyCSUN encampment on campus on Tuesday. 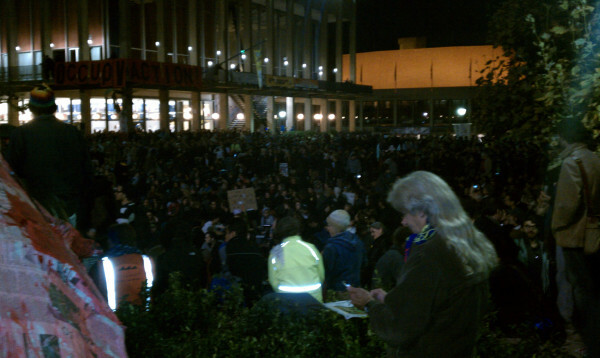 #OccupySD holds its largest General Assembly on Tuesday, with some 1200 people. #OccupyOakland demonstrator is under threat of deportation after being arrested while meditating during a police raid of one of the Oakland encampments a few days ago. This entry was posted on 15 November 2011 at 12:24 pm and is filed under UC Berkeley, UC Davis. You can follow any responses to this entry through the RSS 2.0 feed. You can leave a response, or trackback from your own site.